Volume 4, Edition 15 Trouble loading? View this email online. 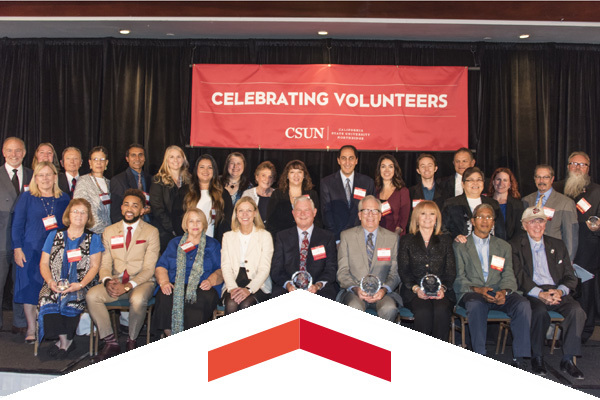 CSUN honored some of its most devoted alumni and friends at the 15th annual Volunteer Service Awards on Nov. 18. Top awards went to Phil Mundy, Sally Magaram and Daniel Blake, while champions for alumni chapters and the university were also honored. 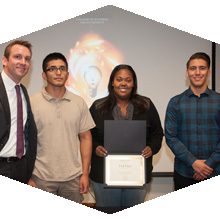 The second annual Fast Pitch event, an “elevator pitch” competition between 10 student teams, saw more than its fair share of innovative ideas, headlined by the grand prize winner WebApes, which is developing smart script internet code to help the visually impaired better navigate through websites. 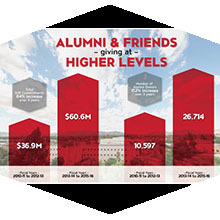 CSUN alumni and supporters of the university set a new standard for giving in 2015-2016. For the third year in a row, nearly $20 million in gift commitments have been made to CSUN, putting the three-year total at $60.5 million, compared to $36.9 million from the prior three-year period – a 64 percent increase. Fri, Nov. 25, 7:30 p.m. Celebrate the Thanksgiving holiday weekend by watching the Matadors take on the University of Detroit Mercy at the Matadome. CSUN will also face either Michigan State or Delaware on Nov. 26. Thurs, Dec. 1, 7:30 p.m. Academics, journalists, comedians and musicians will be gathering at the VPAC to draw attention to human rights violations taking place in Iran. Fri, Dec. 2, 8 p.m.
Get into the Christmas spirit early this year by enjoying classical masterpieces, folk songs and holiday classics performed by the illustrious Vienna Boys choir. Over the Thanksgiving break, the Matadors will compete in the prestigious Wooden Legacy tournament against Texas A&M on Nov. 24 at 11 a.m. The matchup will take place in Titan Gym at Cal State Fullerton. The following day, the Matadors will face either New Mexico or Virginia Tech. Celebrate Indigenous Awareness Month by enjoying American Indian dance, music, food, crafts and more from 10 a.m. to 9 p.m. at the Sierra Quad. CSUN celebrated the 47th anniversary of the Department of Africana Studies with an open house and keynote lecture during Africana Studies Week. George Takei shared insights from Star Trek, his activism and early years in a Japanese-American internment camp at CSUN’s Valley Performing Arts Center in a special evening lecture on Nov. 15. The event was sponsored by the University Student Union. Faculty, staff, students and alumni can purchase tickets in specially designated sections to cheer on the Clippers when they play the Portland Trail Blazers. December pay warrants will be distributed in the lobby of Bayramian Hall on Dec. 30, from noon to 2 p.m. A form must be filled out and delivered to University Cash Services by Dec. 16. The form is available at University Cash Services or online below. A CSUN photo ID is required in order to release your pay warrant. Employees unable to pick up checks may authorize someone to do so, in writing. Include the name of the authorized person, the employee’s department, the last four digits of the employee’s Social Security number and the employee’s signature. Uncollected checks will be available for department pickup from noon to 4 p.m. on Jan. 3, 2017. For more information, please contact University Cash Services at ext. 7222. CSUN Journalism Professor: Will My Students Find Sanctuary?